Water Weakness. If the brown minion begins it's turn in water, it takes 2 (1d4) acid damage. Ridiculous Loyalty. The brown minion has advantage on saving throws against being charmed. Slow Death. When the brown minion is killed, it is instead reduced to 0 hit points unless killed by an Overlord's Sacrifice Minion ability. While it is reduced to 0 hit points, it remains that state for 3 turns and at the end of the 3 turns it dies. Fists. Melee Weapon Attack: +3 to hit, reach 5 ft., one target. Hit: 4 (1d6 + 1) bludgeoning damage. 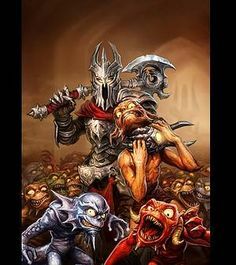 Minions seek to serve their evil Overlord (5e Class) in any way possible, from slaying all of his foes from letting him blow them up for his amusement. They do not fear death and will walk straight into battle with no concern for their own safety or be sacrificed for their life force merely because 'THE MASTER!!!' told them to. Minion Types. There are four types of minions, each associated with various elements. The types of minions are Brown, Red, Blue, and Green. Overlords will often throw variety into their pack of minions so that there is an equal amount of Brown Minions stupidly running into combat, Red Minions pitching fireballs, Blue Minions correcting the blunders of their fellows, and Green Minions leaping upon their foes to tear them to pieces. Little Brutes. Brown Minions are the most strong (and possibly the most stupid) of all of their minion brethren. They attack enemies with glee, and can take more damage from them than most other minions can.